Although the Spinc walk receives more traffic, the views from Camaderry on the other side of the Upper Lake at Glendalough are at least as good and make for a fine walk. Starting from the car park at the Upper Lake in Glendalough, head towards the lake and follow the wide path running westwards along the northern side of the lake. 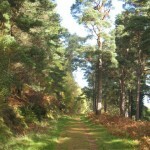 A short distance along this path is the Education Centre. Just after this, take the smaller path on the right heading uphill. 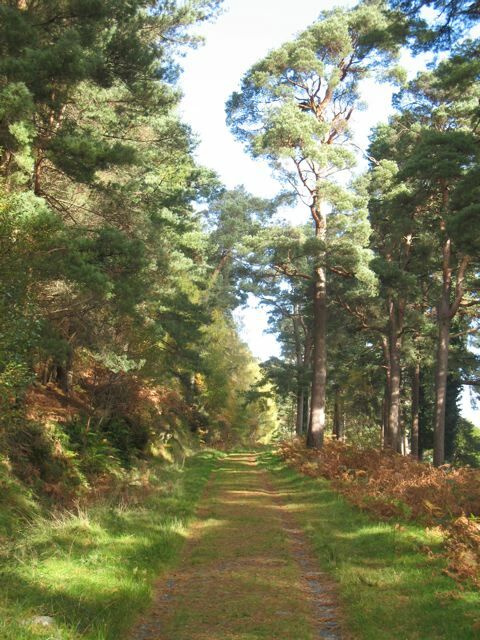 Follow this path through a lovely forest until it takes a sharp turn left into a clearing. Take the small path on the right (its the only path) uphill. 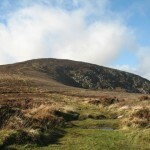 The trees are quickly left behind and on the open mountainside the path leading to the SE summit of Camaderry is clearly visible. At the SE summit, continue on the path to reach the NW (slightly higher) summit. From the NW summit, the two reservoir lakes at Turlough Hill are visible. Head towards the southernmost lake (on the left). 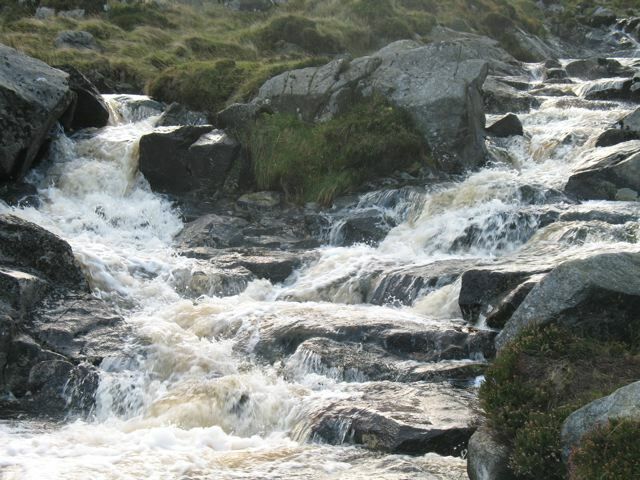 The path quickly disappears and its necessary to pick your way through a series of peat hags. As you approach the reservoir, bear left and downhill towards the Glenealo River. Note that it is essential not to start the descent left too early (i.e. before nearing the reservoir) as there are dangerous cliffs between the summit of Camaderry and the Upper Lake. At the river, turn left back towards Glendalough. Follow the river to where it joins the path coming down from the Spinc ridge. Join the path and it follow it down beside the Glenealo River to reach the miners village at the western end of the Upper Lake. Follow the path that runs along the northern side of the lake to return to the car park. 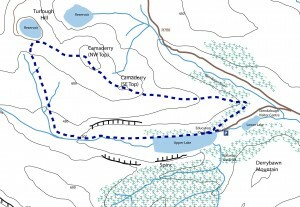 Since the google map for Glendalough lacks detail just now, the map below is below is probably more useful. Excellent web site. Makes looking for walks an easy and worthwhile task. Should be a big boost to attracting people to the locality both nationally and internationally. I will be doing the walk in the near future and if your maps is as good in practive as it is on the web site it deserves 5 out of 5. It may be helpful to include more compass bearings in the narative of the walk as they can be very helpful if the mist comes down, it makes the walk much safer. I did this walk recently and I was very impressed with the directions for the start of the walk. More directions are required for the second half. As a result I wish to downgrate my rating from a 5 to a 3.50. If you could suggest improvements to the directions I’d be more than happy to include them. Did walk on Saturday 11/09/2010. Total bog from the reservoir down to the bridge. The up side was the deer that stood very close to us, looking at us making very slow progress. Need a sign or land mark to mark the turn down as we certainly did not go the correct way. Took an hour and a half just to squelch the bog bit !! Did this walk today (28/12/11). 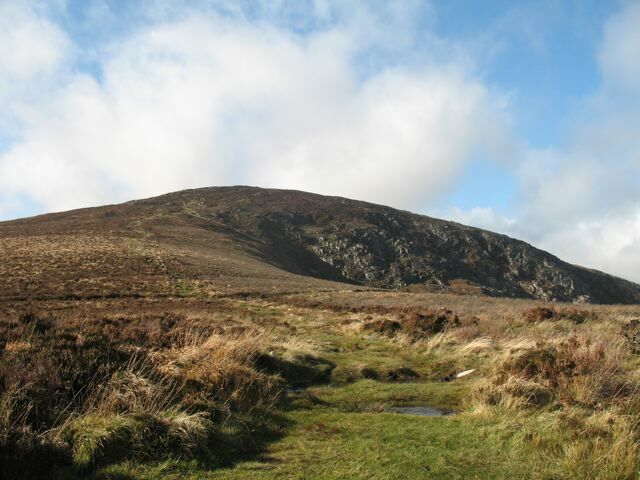 Great walk – a bit boggy once you come off the summit of Camaderry but a great adventure. Took 3 hours 40 minutes but that was with no breaks of significance – too cold and windy to sit around!! We also saw deer at close quarters. 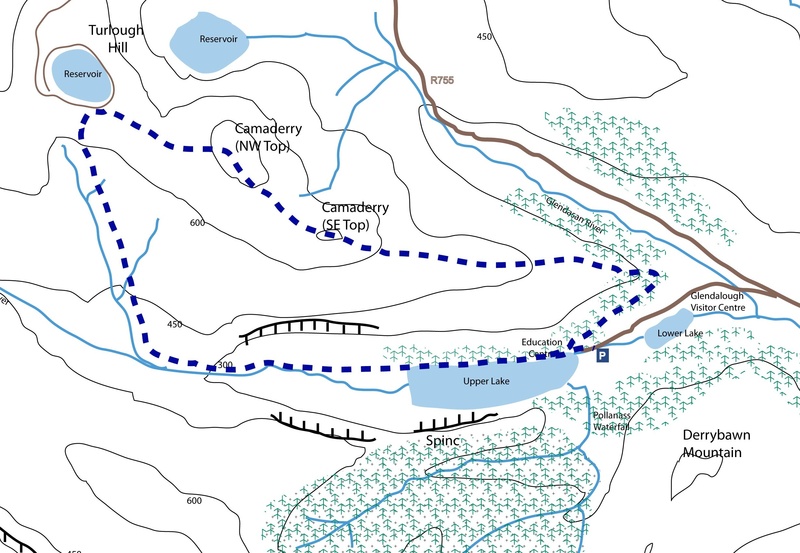 Did this walk yesterday – could only see 1 reservoir from the top, but was pretty sure it was the right one (or rather the ‘left’ one if you know what I mean). Took about 4 hours, included break – the lack of rain over the past months meant the bog was easy going- however, if the bog was any wetter it would have been quite difficult under foot. It’s open mountain, so cold wind is to be expected (it was very cold for April). I’ve walked Camaderry many times but this was my first time coming down this way (usually just came back down the the route as up) – overall, a big thumbs up, give yourself 4-5 hours, good clothing and foot wear essential. Hello :) A friend of mine and I would like to do one of these tours, preferably the Camaderry walk. Our question is, are there proper directions given, so that you can easily find your way and if there is a possibilty to get a card of this area. We just ask because we have to take the bus and don´t have the time to get lost. Hi. Did this walk last August. The decent you have illustrated was a bit too over grown to use so we headed to the top of the next valley (Glenealo proper) and followed the river down to the bridge. 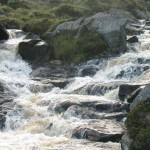 A great walk Although a little caution is needed to use this route as you are walking on top of a blanket bog which has hidden channels through which water flows or has flowed so you may find your foot can drop in to the ground unexpectedly.this route will also add about an hour to the hike. All in all a great experience. Will defo be doing it again. Also admin I can send you a far more detailed map I have created if you like. Walked this today. Took over five hours. Nice in the valley. Very windy on top with limited visibility. Very boggy in many places. Walk down from reservoir was very tough. No clear paths. I did this walk yesterday, it took about 4hrs in total. Excellent views, brilliant directions and outstanding pathways. I will be back to do it again. I completed this walk on the last weekend of September. I would warn any walker against picking your way downhill from the reservoir approach, as you return to the lake. There is, as said, no defined path or route. Given that the recent weather had been reasonable, finding your way through the reeds was very boggy and my foot sank to the top of its boot from time to time. Alternatively, making your way through the heather beds is treacherous as you cannot see the potholes. These can be deep and as your weight is on the forward foot on the downhill, I felt lucky not to twist or damage my knee or ankle despite the number of times I fell into said holes. Finding a continuous grassy trail between the heather beds and the reed beds (nearer the river) would be the theoretical ideal but that’s similar to getting struck by lightning and winning the lottery. Ecologically, successive walkers tramping through heather and reed beds along random and various paths sounds like a disaster for both plant and wildlife. good times :) will be doing it again – probably heading the opposite way. You can adjust all of your cookie settings using the tabs on the left hand side. Necessary Cookies These are needed for the proper operation of the website. Third Party Cookies Only non-personalised adverts are displayed, but Google still need to set cookies to help with ad management. This web site is not for profit and the adverts help to offset the hosting costs. Please help out by enabling these cookies. Cookies are set by wicklowwalks.com to record your cookie preferences and allow user login. You can disable these using the switch below. We also use CloudFlare for content delivery. They set a cookie which they say contains no personally identifiable information and provide no opt out (it cannot be disabled). If you disable these cookies, we will not be able to save your preferences. This means that every time you visit this website you will need to enable or disable cookies again and will not be able to use the website as a logged-in user. We care about your privacy and only non-personalised adverts are displayed i.e. they are tuned to the web site topics but do not use information about you personally. Nevertheless, Google still need to set cookies for ad management, see Google’s policy. This web site is not for profit. The adverts help to offset the hosting costs. Please help out by enabling these cookies. If you're concerned about privacy you might want to disable these, although the Like button will then not work.